We just got each a tricycle last weekend. 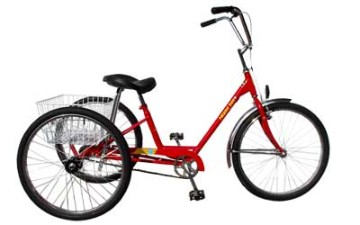 It's been our plan to go biking every chance we get but it's only now that we finally got the bikes...well, trikes. Why tricycles? It's more fun? Partly but also because the little one hasn't learned how to use a bicycle yet. She fell off her bike one time and she wouldn't get on it anymore...well, until recently. Unfortunately, her bike is too small for her now. As for me, I can bike...but I haven't been on bicycle in more than 20 years. I learned to bike a bit late...in high school already because my parents wouldn't allow me to get on one. I finally learned because a friend had a bike she used to take with her when we'd go around the neighborhood. But even if I learned how to bike, I never had the chance to bike as much so you can say that I've always been a 'nervous' biker. I like that bike Huling! Parang wala pa yata akong nakikitang ganyan dito na pang-adult. Safe na safe for everyone! It sure will be a lot of fun for the three of you. Baka naman mag-inter-state biking na kayong tatlo ha?! May extra bike pa dito e, pwede ba ako mag-join? hehe..